I found myself really won over by the first episode of Batman: The Enemy Within. Telltale Games continued what worked in the first season, which was putting new twists on familiar characters, and made some smart changes to combat that helped the overall experience. It also managed to surprise me by being a largely self-contained story that led into setting up a much larger one. Episode two, The Pact, isn’t as much as a complete story as The Enigma, but it manages to weave together the loose threads from the first episode into a story that is worthy of spanning multiple episodes. All of the pieces are starting to fall in place, and that’s exciting for a game based around a central mystery. While the larger picture is beginning to appear, it’s still blurry enough for speculation to run wild. The Pact begins with an encounter with a new villain to the series, Bane. 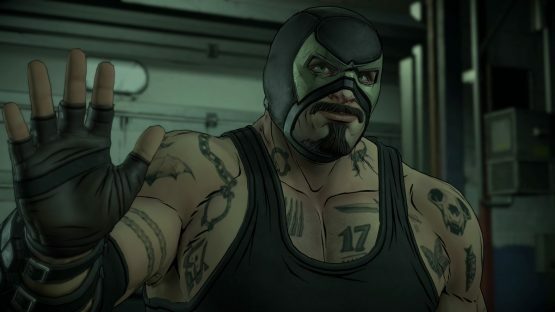 The legendary Batman foe isn’t one of my favorites, but thankfully, Telltale’s version isn’t a Tom Hardy knockoff. Instead, he’s a luchador mask wearing badass that likes to inject experimental drugs directly into his neck. He’s a total force to be reckoned with here, and he ends up dominating Batman in their first encounter. Since Batman can’t out-muscle Bane, he comes to the decision that this is a job for another man. No, he’s not reaching out to a fellow superhero, rather he’s taking off the mask and getting Bruce Wayne involved. This leads to Wayne, posing as a bored billionaire that is looking for excitement (maybe he doesn’t have to play the role that much), attempting to infiltrate Bane’s group from within the inside. Getting to go undercover as Bruce Wayne is a very refreshing spin on Batman, as the series has always been slightly more about action than actual detective work. This does a great job of restricting the player (Bruce can’t beat up everyone or use his weaponry), and forcing them to really watch their actions. Things start out with a meeting with John Doe (the Joker), who quickly introduces Wayne to other villains in their group: Harley Quinn and Mr. Freeze. While Harley Quinn is regularly depicted as being obsessed with the Joker, The Enemy Within has a different interpretation. Roles are reversed as John Doe is constantly trying to win her over (and getting jealous when she flirts with Bruce), and while she seems interested in the Joker, she’s not a slave to his command. It’s a really fun take on the character, and I actually found myself liking her a lot throughout the episode. The bulk of the episode revolves around trying to win the trust of these villainous characters, and it winds up being a real test of both the player and Batman’s morals. It’s easy to say that you wouldn’t be willing to watch an innocent person get beaten in order to advance in your own pursuits, but when speaking up can result in a horrific outcome, playing along becomes a much more attractive option. These sort of moral dilemmas aren’t new for Telltale, and the first episode had a great one during its final scene, but it’s still very effective here. On top of the fun character interactions, there’s also a lot of actual investigating areas and walking around during this episode. 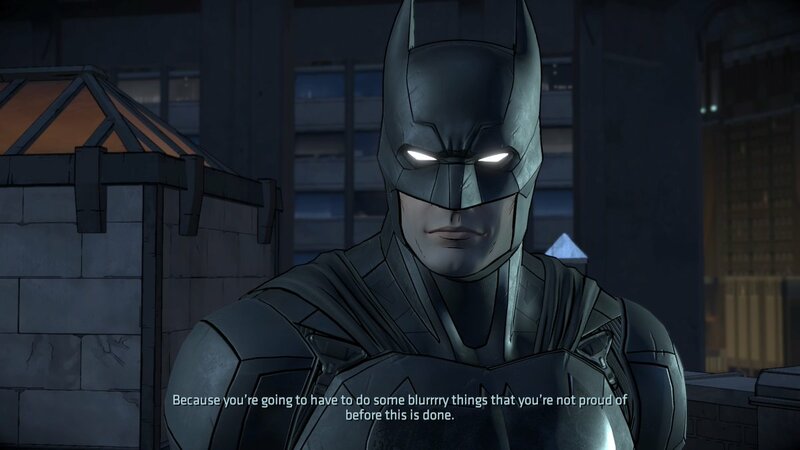 Telltale has done a great job of showing the smarts of Bruce Wayne, and why he’s the star of Detective Comics. The Pact is filled with uncomfortable moments that force the player to choose between the right thing and their cover. It also makes important moves to flesh out the season’s story arc, and ends with an awesome teaser for episode three. Telltale Games is on a roll this season, and The Enemy Within continues to be some of the developer’s best work. Batman The Enemy Within Episode 2 review code provided by publisher. Version 1.05 reviewed on PlayStation 4 Pro. For more information on scoring, please read our Review Policy.